Big River in full flow at last year's Ivan Straker Memorial Steeplechase at Kelso (picture by Alan Raeburn). 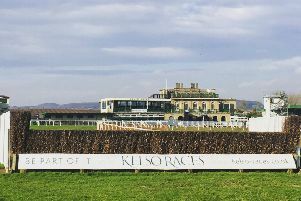 The British Horseracing Authority (BHA) has given the green light for racing to go ahead, following a six day shut-down because of equine influenza – just in time for tomorrow’s Morebattle Hurdle Day at Kelso Racecourse. The seven-race programme has attracted a bumper entry of 180 horses, including Definitely Red in the Malcolm Jefferson Memorial Steeplechase. Trained by Brian Ellison, Definitely Red is unbeaten in the highest company this season and is being targeted at the Cheltenham Gold Cup next month. Run in previous years to commemorate Ivan Straker, the £25,000 Malcolm Jefferson Memorial Chase was won last year by Lucinda Russell’s Big River, owned by the Two Black Labs, whose distinctive colours include a silhouette of a black labrador. Big River is entered once again. Ruth Jefferson, who enjoyed her first winner as a trainer with Cyrus Darius on this card last year, plans to run the promising bumper-horse Black Ebony in the final race of the day, the Racing TV Standard Open National Hunt Flat Race. Other horses that will be using tomorrow’s (Thursday) fixture as a springboard to the Cheltenham Festival include We Have A Dream and Pacha Du Polder. Trained by Nicky Henderson, who is also planning to run Dream Du Grand Val in the £10,000 Novices Hurdle, We Have A Dream is a live contender for the Champion Hurdle and will start a warm favourite for the feature race of the day, the £30,000 Morebattle Hurdle. Andy Stewart, owner of Pacha Du Polder, is planning to jet in by plane for the event at Kelso. 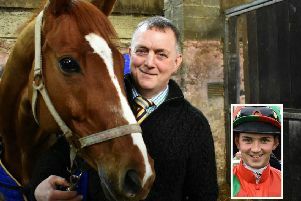 The winner of the last two editions of the Cheltenham Foxhunter Steeplechase, Pacha Du Polder is being prepared for a prestigious hat-trick by trainer Paul Nicholls and will be face stiff competition in Kelso’s Open Hunterchase from Richard Hobson’s Shantou Flyer and last year’s winner Sir Jack Yeats. Some of the horses originally entered will have been subsequently ruled out by the BHA’s new rule, intended to reduce any risk of spreading the ‘flu disease, that every horse must have been vaccinated within the last six months. This is likely to include Lakeview Lad, one of three horses from Scotland, which are being targeted at the Grand National in April. However, a further opportunity for these horses exists at the next race meeting at Kelso, on Saturday, March 2, in the shape of the £60,000 Premier Steeplechase – reported to be the next target of Lucinda Russell’s Grand National winner One For Arthur. Other races on the programme, which boasts total prize money of £100,000, include a £14,000 Novices Steeplechase and the £12,000 Brewin Dolphin Handicap Hurdle, which has attracted the strongest field of all. Jedburgh-based trainer Harriet Graham will have a strong hand with Aye Right, who looks likely to get into the race with an attractive weight. The first race gets under way at 1.25pm and gates will open at 11.30am.